"A place like that is a hotbed of allergic activity." All Grown Up continues to go strong after a couple of years on Nickelodeon. This series has fans of The Rugrats dialing into every episode, as they can easily follow the pre-teen adventures of their favorite characters. All of the gang is here, including Chuckie, Dil, Tommy, and Angelica, still adjusting to the hardships that adolescence bring about. Of course, these hardships are of the fun variety, ranging from evil school teachers to having fun when school is out in the summer. Paramount Home Video continues to release this show as a series of "greatest hits" DVDs, with All Grown Up: Dude, Where's My Horse? being the latest. As these releases approach the double digits, it seems to be high time for the show to receive the seasonal box set treatment. Then again, the studio might feel as if it's pointless to change their release format now that most of the show's installments are available on DVD. In this case, the lone featured episode on this disc, Dude, Where's My Horse?, is a dual-length mini-movie that runs slightly less than one hour. This is a slight departure from some of the other All Grown Up DVDs, most of which have multiple episodes. The patented "Bonus Episodes" are here, though, stretching the disc's total running time to just over an hour and a half. The aforementioned feature presentation, Dude, Where's My Horse?, is one of the better stories that the show's writers have come up with, at least out of the episodes of the show that I've managed to see, which, I'm sure, isn't as many as the die-hard fans out there. From a parent's perspective, I'm eager for my 10-year-old to see this episode, as it tells the tale of the main characters' time on Grandpa Lou's buddy, Red's, ranch, teaching the value of leadership along the way. Tommy is more than eager to accept Grandpa Lou's challenge to actually work at the ranch, but his friends are reluctant. When they discover the joys of a cattle drive, Dil, Chuckie, etc. quickly change their tune. Tommy's struggles with the cattle dampen his spirits, but this is where the leadership lesson comes into play. He is soon called upon to lead the kids to their destination when their trail master is lost, and what Tommy accomplishes is amazing, even by cartoon standards. The "Bonus Episodes" offer up pretty standard All Grown Up fare. The first show is called Blind Man's Bluff, which takes the kids to their favorite water park that Susie has just scored free tickets to. The tickets are actually to her singing performance at the water park, Slosh Mountain, but the kids are more concerned with riding the best ride they've ever seen, Whiplash Gorge. This episode teaches kids the importance of responsibility and care for their elders, as Tommy and Dil find out that they have to care for Grandpa Boris after he has cataract surgery the day they are supposed to go to the park. Tommy and Dil learn a few lessons, actually, after they decide to take Grandpa Boris to the park with them, and wind up losing him. The other episode is Yu-Gotta-Go, the All Grown Up take on the Yu-Gi-Oh phenomenon. This is about as close as this show will come to teaching kids the dangers of gambling, Chuckie gets a little too involved in this new card game and almost trades a valuable stamp collection for a chance at further glory. All of the funny, crazy antics that fans are used to are in play during this episode, as well, with the very popular Chuckie character continuing to be one of the best animated kids in recent years. Image Transfer Review: Again, these episodes are in their original full frame format, and are slightly better-looking, with brighter, more vivid colors, than they are on television. The color-rendering brings out each and every detail in the characters. There aren't any print flaws, either, but the young age of the source material makes this less of a surprise. Audio Transfer Review: The episodes are in Dolby Digital 2.0, which is perfectly suited for the material. The surrounds are very active, with the wide dynamic range enhancing the overall experience. The dialogue is crystal clear, and blends in just fine with the rest of the mix. 5 Other Trailer(s) featuring Rugrats Tales from the Crib: Snow White, Lemony Snicket's A Series of Unfortunate Events, The SpongeBob SquarePants Movie, SpongeBob SquarePants, The Fairly OddParents! Extras Review: Aside from Previews for other Paramount Home Video releases, there aren't any extras on this disc. 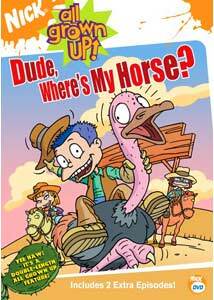 All Grown Up: Dude, Where's My Horse? is another great collection from one of the most popular kids' shows on TV. The audio and video quality is as impressive as it has been for the series' other DVDs, but there still aren't any extras to speak of.